Delegates of the Salt Lake County Democratic Party met Saturday morning to elect a county mayor among four candidates to replace now-Rep. Ben McAdams. Jenny Wilson received the most votes and was elected Salt Lake County Mayor. Wilson has a long history of working towards LGBT rights. 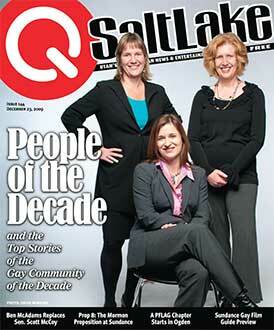 In 2009, QSaltLake Magazine named her, along with then-Salt Lake City Council members Deeda Seed and Jill Remington Love, People of the Decade. Wilson worked tirelessly while on the Salt Lake County Council 20 years ago to provide benefits for partners of gay and transgender county employees. The County Council, freshly under Democratic majority, voted 6–3 for such benefits in February, 2009. She also was instrumental in securing protections for LGBT people in hiring and housing in the County, among the first few municipalities in the state to do so. Most recently, Wilson ran for the United States Senate against Mitt Romney. Wilson faced former congressional candidate Shireen Ghorbani, County Council member Arlyn Bradshaw, and perennial candidate Stone Fonua for the seat. She will be sworn in on Tuesday.